A fun and witty look at a young british guy lifes, be that random ramblines or actual happenings. A true-life story of DJH. 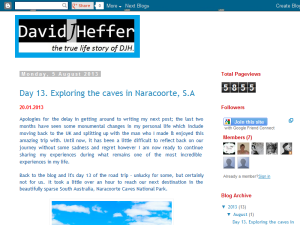 This what your DavidJHeffer Blog Ad will look like to visitors! Of course you will want to use keywords and ad targeting to get the most out of your ad campaign! So purchase an ad space today before there all gone! Day 12. First day in S.A, a giant sink hole and a lake that made us feel blue! Day 10 & 11. Thunder Cave, Sherbrook River and London Bridge (or Arch)! Day 10. The Twelve Apostles and Loch Ard Gorge! Day 9. The beginning of the Great Ocean Road! Day 7. A queer day at Midsumma and a trip to St. Kilda beach! If you are the owner of DavidJHeffer, or someone who enjoys this blog why not upgrade it to a Featured Listing or Permanent Listing?